This chair is included in the exhibition Joris Laarman Lab: Design in the Digital Age, on view at Cooper Hewitt, Smithsonian Design Museum through January 15, 2018. This Pixel chair (prototype) is part of a series of twelve unique Makerchairs designed by Joris Laarman and fabricated by Joris Laarman Lab. To make the bending grid pattern of this chair, large slabs of resin are cut into nearly three-hundred unique pieces by a computer numerical control or CNC–directed router. The pieces are then assembled using an adherent, and finished by hand. 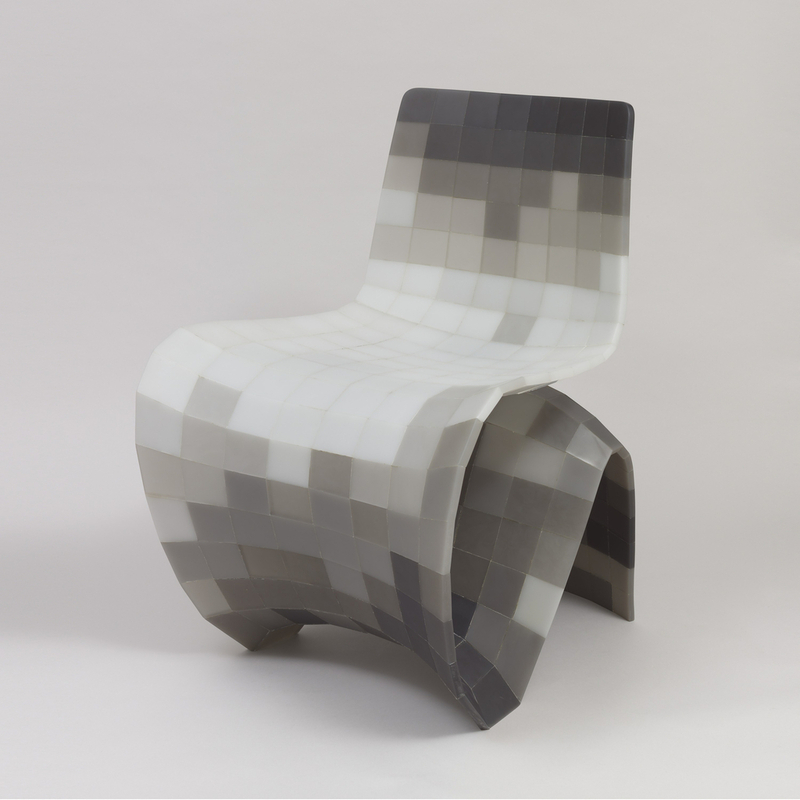 The arrangement of grayscale pattern pieces gives the “pixelated” effect of a magnified black and white digital image, visually reinforcing the digital element of the chair’s fabrication. Born in 1979, in Broculo, Netherlands, Laarman first gained international attention in 2003 for the Heatwave Radiator, his senior thesis project at the Design Academy in Eindhoven. Since founding Joris Laarman Lab with partner Anita Star in 2004, Laarman has continued to design objects that consider decoration and pattern in lockstep with function. Today, the Lab has become a powerhouse innovator of digital fabrication, and a home for experimentation with emerging technologies and their application to furniture design. Anticipating a near future when “every big city will have professional production workshops as well as crowd-fabrication hubs for DIY makers,” in 2014, Joris Laarman Lab expanded to include Bits & Parts, an initiative described as a “spin-off” of the Makerchair and “a new concept for the digital fabrication revolution.” Available for download at no cost to the maker, the modified Makerchair blueprints reduce 202 individual parts to 85 three-dimensional puzzle-pieces that can be easily reproduced using small consumer 3D printers and CNC milling machines. The Pixel Makerchair prototype is an example of Joris Laarman Lab’s effort to advance design innovation taking place both inside and outside the walls of the studio, expanding the user’s relationship with furniture, and blurring lines between designer, maker, and consumer. The concept driving the Makerchair draws questions about whether or not the body and mind are affected by sitting in a chair in which they have had a hand in the making, yet the chair’s beautifully executed, functional form does not invite extended lounging and contemplation. The Makerchair’s success lies in the uncommon, distinctive ambition to be a chair that encourages us to get up out of our seats, and start making. Anne Carlisle is a Curatorial Intern at Cooper Hewitt, Smithsonian Design Museum, while earning her master’s degree at Bard Graduate Center. She recently curated the exhibition Wood, Revisited at The Center for Art in Wood in Philadelphia, and works in the Communications department at The Architectural League of New York.